While others before me have characterized the Neon goby as an easy to breed saltwater fish species, my personal experience with Elacatinus oceanops suggests they are not always quite that easy. You don’t have to wait for the fish to bond and pair-up, which means you can hope to have eggs much sooner. On a cold winter evening in January, I clicked the ‘BUY IT NOW’ button, selected a few additional items to distribute the cost of shipping, and the pair was packed up with an eclectic mix of sea life to begin their 24 hour journey to the Philadelphia suburbs. The Neon goby pair had a seat in the cargo area of a Federal Express plane, along with a pencil sea urchin, a condylactis anemone (complete with a symbiotic anemone shrimp), an orange ricordea and a cluster of cinnamon zoanthids. 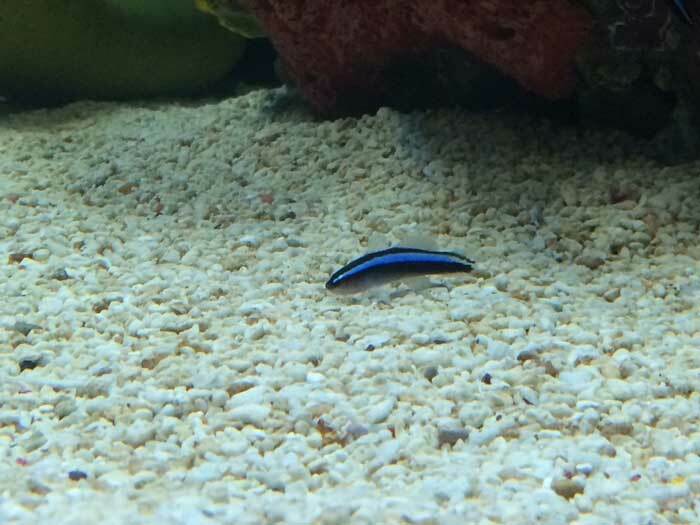 The Neon goby pair, living up to their species reputation, began spawning about 2 weeks after introduction into my tank (not even long enough to have officially cleared ‘quarantine’, had I not been using a dedicated tank), and would continue to spawn exactly on every 10th day. Unfortunately, the spawning stopped as quickly as it started. After several more cycles, they stopped spawning abruptly and completely. I clung to hope and watched for months—hoping, waiting and checking for any sign that a spawn was on the horizon, but they never spawned again. I estimate that nearly 3600 Neon goby eggs made their way from the breeding tank, to the grow-out tank. While it took almost no effort on my part to encourage the pair to spawn in their, I did learn five lessons about marine fish breeding that I would like to share with you. had fully matured and hatched. 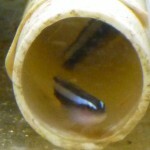 As soon as I added a ¼ inch diameter PVC pipe to the tank as a nesting option, the pair left their ½ inch diameter home and took up residence in the new tube. Every spawn after the switch hatched out. It appeared that providing the gobies with a few options of suitable spawning structures improved the likelihood of full-term egg development. My conclusion is that the 1/4-inch pipe was the best–but the next time I try to breed the Neon goby, but it is also fair to note that this was not a scientifically controlled experiment. It very well could have just be that the fish needed a few spawning attempts under their piscine belts before they figured out exactly what they were ready. My advice to you would be to offer a few different sized options and let them select the size that works best for them. I had significant improvements in the survival rate (measured in # of days) of the Neon goby larvae when I switched from an opaque, oblong container to a black round tub. My original grow-out tub of choice was chosen because it was a size/shape that would allow me to put the spawning nest (inside a small diameter PVC pipe) diagonally upright with an air stone placed at the bottom to create a gentle, upward flow until the eggs hatched. I knew that water flow would be critical to keep the eggs viable once removed from the attention of the hovering male. What I didn’t realize, at the time, was that it is actually pretty easy to create an upward current through a PVC tube, in any kind of a tank. Switching to a black round tub provided two advantages over the original tank: the black color provided a dark contrast for the larvae to sight their prey organisms (Wittenrich 2008); and the round shape provided an efficient, circular flow in the tank which appeared to distribute the prey (and larvae) evenly throughout the tank. I found out that the heater I was using, while rated for a volume of water much larger than was actually being used, was ineffective at keeping the temperature stable. I had a lot of critical casualties from a malfunction, before I realized the heater wasn’t working properly. As soon as I replaced the heater, those problems went away. Be sure to monitor your temperature regularly, and don’t buy a cheap heater. With a few months of learning curve under my belt, I was able to keep more larvae alive for longer periods of time, and for the first time, I was having success with more than one batch of larvae at a time. At one critical point, there were two groups of larvae, from eggs laid 10 days apart, growing out in separate black round tubs, while a third cluster of eggs was ready to hatch. The problems I faced were that I didn’t have enough gear or enough time to manage three tubs of Neon goby larvae. I took a few shortcuts, was unprepared and made a catastrophic mistake. Rather than buy and set up an additional air pump for the third grow-out tub, I just spliced the air supply line one more time. I awoke in the morning to find all three tanks nearly void of life—no doubt suffocated from the lethal cocktail of reduced oxygen/water flow and increased oxygen demand (from all the larvae and food organisms). The bottom line is this—until the third batch came along, I had achieved my greatest success. The work load was about all I could handle—both from a time and resource perspective. The third batch set me back irrecoverably. I had insufficient time and equipment, I cut corners, and I lost all three batches. While breeding and rearing larvae through metamorphosis is somewhat of a numbers/probability game, trying to keep every hatch actually reduces your chances, unless you have unlimited time, space and equipment. Take your time and don’t count your Neon goby larvae before they have hatched. Motel 6 advertises that they leave the light on for you, as a reason to stay with them—perhaps their target market segment is marine fish breeders, but this is the last important trick I employed to help improve the survival of the fragile newly hatched larvae. In those first hours after hatch, the larvae must learn to locate, capture and eat their first food. Since Neon goby larvae generally hatch just after lights-out, the first natural chance of finding and capturing prey is in the morning—perhaps 8-10 hours after hatch. While some marine species, like clownfish, have a rather large egg yolk still remaining after hatch, the neon gobies appeared to have almost none, which means they need their first meal rather quickly after launch. I had much better results when I angled a flashlight over the grow-out tub for the first week, then when I did not. After my initial attempts at captive breeding the Neon goby, Elacatinus oceanops, I had less success getting other pairs to spawn. One truly frustrating aspect of husbandry for this fish is that they are not long-lived fish. There really isn’t all that much time between maturity and old age. 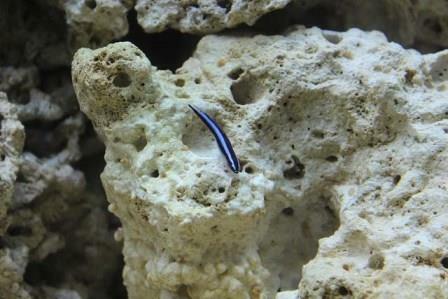 But the Neon goby is a functional and fantastic beginner fish for any interested saltwater aquarium hobbyist. 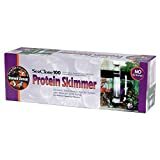 They are a perfect saltwater fish for any size saltwater tank, including nano and pico tanks. Over the years since my initial work with the Neon goby, copepods have become much easier to purchase, which should boost survival rates compared with what I was getting by using rotifers. For more information about breeding saltwater fish, I recommend two books that I also used as references for this article here. For more information about breeding the Neon goby or any other saltwater fish, for that matter, I recommend you check out MBI and MOFIB. Wittenrich, Matthew L.. The Complete Illustrated Breeder’s Guide to Marine Aquarium Fishes. Charlotte, VT: T.F.H. Publications, 2007. Wilkerson, Joyce D. Clownfishes: A Guide to Their Captive Care, Breeding & Natural History. Neptune City, NJ: T.F.H. Publications, 2001. Written by Albert B. Ulrich III–author of The Reef Aquarium Series of books: The New Saltwater Aquarium Guide, How to Frag Corals, 107 Tips for the Marine Reef Aquarium. 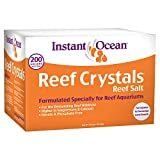 I searched your site for tips on raising copeods and amphipods and found this article.Do you ever have plans on raising copepods and amphipods to use as live food? ‘ve just started raising them. They are awesome to watch.